A popular Kingaroy story claims West Indian fast bowler and cricketing giant Wesley Hall once successfully threw a cricket ball over the towering Kingaroy silos. Hall visited Kingaroy in 1962 on a promotional visit during his stint as a fast bowler for Queensland’s Sheffield Shield team. Unfortunately for cricket fans, Wes Hall did try but failed with his three attempts. 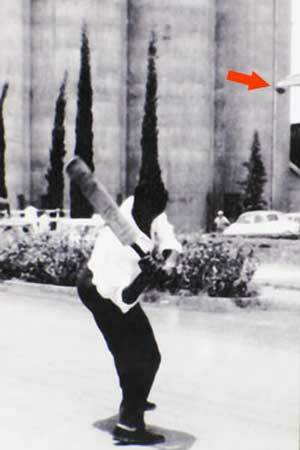 According to the Kingaroy Herald News (January 25, 1962): “The giant West Indian all-rounder smacked a ball high over a stack of 12,500 bags of peanuts, three times threw one on to the roof of the silos and topped it all with some prodigious swings in a spectacular but unsuccessful bid … to hit a ball over the silos”. A few days later, Hall – fuelled up on all the raw peanuts he ate during his visit to Kingaroy – took six wickets for 29 for Queensland to demoralise the South Australian Sheffield Shield team! However Hall’s silo efforts stirred local interest and during the 1962 Peanut Festival Carnival a “silo-throwing” competition was held with the Peanut Marketing Board (now PCA) donating trophies. The South Burnett Times photographed the winner Ermes Pez, 22, a Canadian in Australia under the International Exchange Scheme. Pez at first tried to toss a baseball over the silos but twice fell short, breaking one of the windows near the roof. He switched to a cricket ball and got it over on his first attempt. Until Pez’s success, Kingaroy’s Jimmy Freshwater was the only man known to have cleared the silos. He did this at some time during the 1940s as the result of a bet with mates. Other reports also name a Private Otway and an American, Jack Smith, as being successful. We know nothing about these attempts but it appears the silos could have been a tempting challenge to the many servicemen stationed in Kingaroy during World War II. If you have any silo / cricket ball tossing stories to tell email us – we’d love to hear from you! The cricketing connection with the silos continues … The Kingaroy Mail reported this month that while Australian cricketer Matthew Hayden (a Kingaroy local) has never thrown a ball over the silos, his brother Gary has done it twice … on the same day! He apparently threw a ball over the silos during the 1991 Peanut Festival competition and then was asked to throw again by a photographer who told him to “pretend he was throwing”. But he let go and the ball soared over the buildings again! 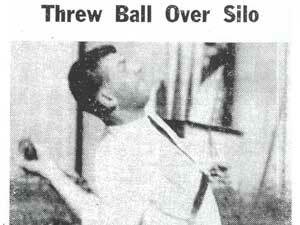 Apparently cricket balls weren’t the only objects whizzing over the silos during the 1960s. Kingaroy golfer Trevin Erichsen also successfully whacked a golf ball over – possibly also in 1962. The 2005 Peanut Festival and an associated report in the local South Burnett Times newspaper prompted a proud Kingaroy mum to contact us. 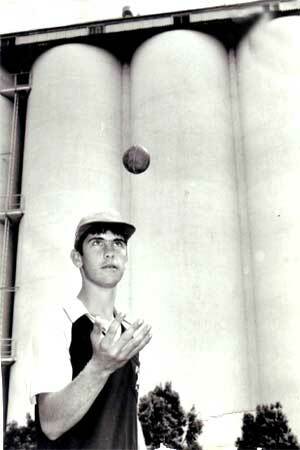 In 1992, Kingaroy schoolboy Warren Cross, then 14, tossed a cricket ball over the silos during a Peanut Festival competition – the only person to do so that year. A report in the South Burnett Times this month detailing the “cricketing” history of the peanut silos reported that Private Otway, (see above) made his successful attempt in 1962. He apparently cleared the silos three times, however he used a baseball not a cricket ball. The report also added another name to the growing list: Harold Kirwin, from Kingaroy, who apparently achieved the feat during the 1970s. Canadian Ermes Pez’s successful effort a little later the same year excited local newspapers!